As a 17 year old in 1955 this young athlete became a Junior Javelin Champion. He then took to the tracks and became an 800m,1500m, 3000m and 10,000m steeplechase Fiji Champion. In 1963 at the inaugural South Pacific Games hosted by Fiji at the age of 25 years he won a silver medal in the 3000m event. The highlight of these Games however was when he brought the 3000 crowd to its feet with excitement in the 10,000m. At the start of the grueling ordeal, 25 laps in hot sunshine on a track still soft from the recent rain, this young man’s running plan was apparent. The field was well strung out and on the 17th lap he moved into second place. There were some anxious moments for Fiji as the end drew near with 300m to go. The Gilbert and Ellice Islanders decided to make his final effort putting on a great spurt and drew near 20m ahead of the Fiji athlete. This was a signal for Fiji’s running plan to the accompaniment of wild shouts from Fiji supporters, as he also took off the breaks. For several seconds it looked as if his opponent had the gold but with an amazing burst of speed, this Fiji runner drew level and then passes him breaking the tape 30m in front of the Gilbert and Ellice Island to win gold for Fiji. This athlete also represented Fiji at the 1966 and 1969 South Pacific Games as well as the Commonwealth Games in 1974, in Christchurch, New Zealand. Upon retiring he ventured into Veterans athletics and continued his winning streak winning a gold medal in the hammer throw and bronze in the javelin at the 7 Oceania Veterans Championships in 1994. This senior athlete founded the Ra, Ba and Vatukoula Athletic Associations and managed and coached many athletic teams to various overseas events including South Pacific, Oceania and World Championships. 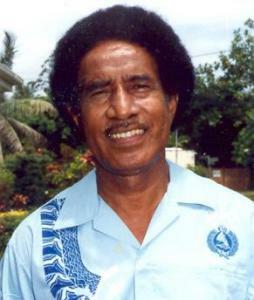 He was President of the Fiji Amateur Athletics Federation in 1970, 75 and 76 and is the current President since he re-election in 1995.